Did you know there's a beautiful island resort with a long golden beach and gorgeous wooden chalets built over the sea just 50 km from Singapore? 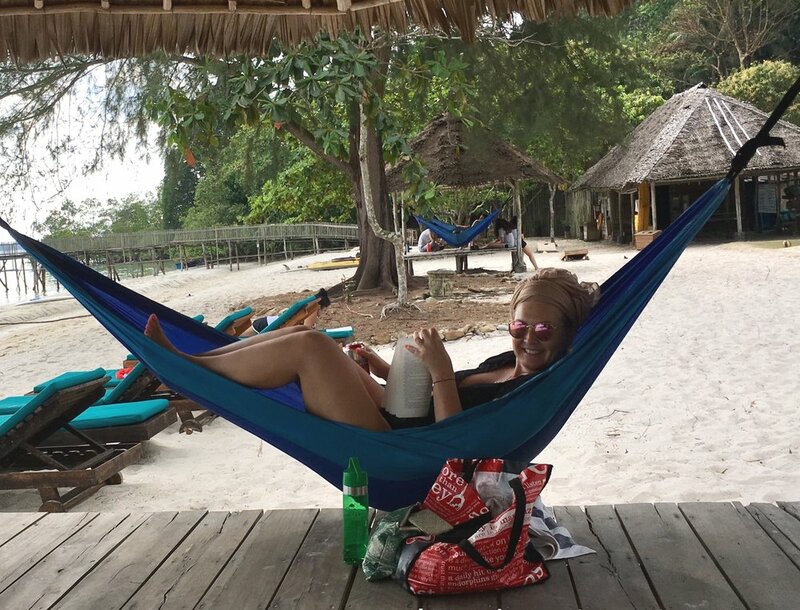 Would you love to relax on this beach gently swinging in a shaded hammock as you read that book you've been dying to get to for months? Would you like to upgrade your Yoga and meditation practice? Get a blissful massage to the sound of the sea knowing that your next delicious buffet meal is being lovingly prepared for you. Chat with new friends or an old buddy you come along with. Or just gaze out to sea letting your eyes rest on the horizon. There's nothing like doing Yoga as the sun rises and then sets over the ocean. Imagine listening to the sea gently lapping under the wooden jetty as you're guided through the best Savasana of your life. This is a Yoga holiday where as soon as you step off the boat you'll disconnect from the stress of everyday life. You'll have all the time you need to unplug and recharge. You’ll love that there’s no wifi and no roads or cars on the entire island. Complete beginners and more advance Yoginis and Yogis as well as all levels of flexibility and strength are welcome and will be well taken care of. Thanks for a lovely few nights away, spent with enjoyable company and fantastic yoga. Very easy getaway from Singapore and highly recommended for those needing a recharge! Pay and register by credit card clicking below or contact me for my bank details to make a bank transfer. There are 3 single rooms. These come with a SG$110 single room supplement. Please note single rooms are similar is size and layout to the shared chalets but don't have a balcony or desk and chair. I thoroughly enjoyed Sarah’s yoga holiday. It was just the right balance of amazing, personalised yoga classes and a fun, relaxing holiday. I felt that I got stronger in my yoga, relaxed and made some wonderful, new friends. The great thing about this Yoga holiday is that there isn't just amazing Yoga on offer twice a day. If you would like to spend some time doing some more active pursuits the resort offers plenty of beach and ball games, line fishing, kayaking, stand-up paddle boards, jetty jumping and even a ceramics workshop. Or you can just relax after your massage and lie on the beach! If you have the energy you can star gaze at the nightly beach bonfire toasting marshmallows as the waves lap the beach with their gentle reassuring rhythm. There are no cars on Sugi island so the air is clean and fresh and noise comes only from the sound of the waves, the wind in the trees, the odd jumping fish, birdsong and a wooden gong to announce the next meal. 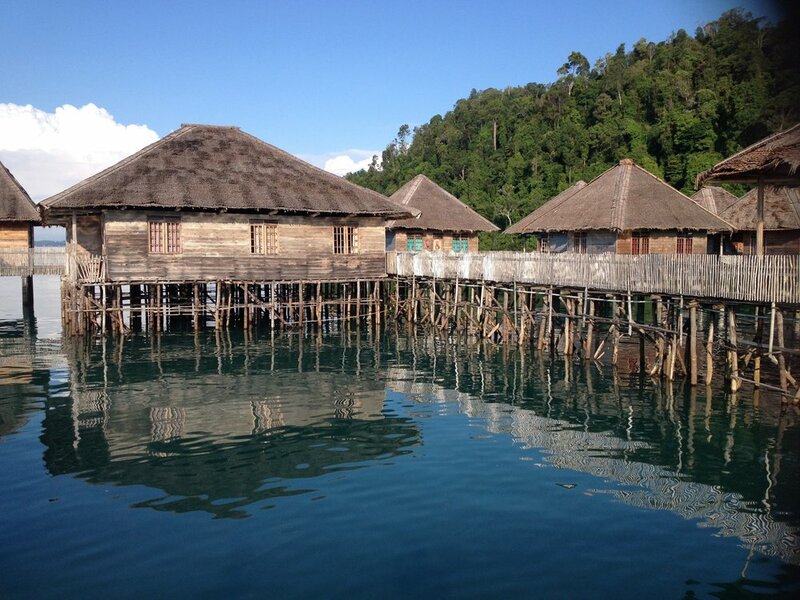 I have been to the Telunas Beach resort in Indonesia with my family and have lead many retreats here too. Each time I step off the boat onto the wooden jetty I see big smiles widen on all those who have traveled together and the collective sighs of wonder. The simple natural surroundings, genuinely happy and friendly staff, the sea, trees, birdsong, big wide sky and beautiful beach all combine in contrast to the rushed concrete city lives we live. This is an Eco friendly, simple, back to nature resort built with natural materials and love. I've always felt very at home here and felt that the natural rhythms of nature come back to me so easily on this magical island. The rhythm of the tides, the huge night skies full of stars and being outside all day in sea air sets the stage beautifully to truly unplugging from the stress of city life. Accommodation is bright, clean, traditional Indonesian 36 m2 chalets all built from the jetty over the sea. All chalets are generous, bright and breezy, have a queen size double bed and a private nook with generous bunk beds . The sound of waves will lull you to sleep and there's no need for air conditioning as the sea breeze keeps the temperature very comfortable. There's also a generous balcony with a fantastic hammock and an ensuite modern bathroom with shower. Fluffy towels, shampoo, conditioner and shower gel are also provided. Rooms are equipped with ceiling, standing fans and extra blankets. All chalets comfortably fit 4 but I've limited us to 2 people to a chalet so you have more space to move around and feel more at ease. I’ve reserved 3 deluxe villas for people who'd prefer a room to themselves. Especially great for those whose priority is to really catch up on some sleep. Everyone is invited to join (Yoginis and Yogis alike) and if you're traveling solo I'll match you up with someone to share with. All meals are buffet style and are a lovingly prepared blend of local and international dishes. There is lots of fresh fruit, veggies with a good balance of deserts and treats. The kitchen is used to adapting and adding dishes for vegetarians, vegans and people with allergies. I'm an experienced, fully trained Yoga teacher E-RYT500 and have been teaching Hatha, Vinyasa and Yin Yoga full time since 2007. I began Yoga as a teenager and have been in love with it's art and science ever since. I draw on my personal experience and training to teach you how to do Yoga poses with good safe alignment that suits your unique body. I want to teach you some of the methods I have found useful in becoming more resilient in negotiating life’s challenges and how Yoga and mindful living can bring more serenity into your life. 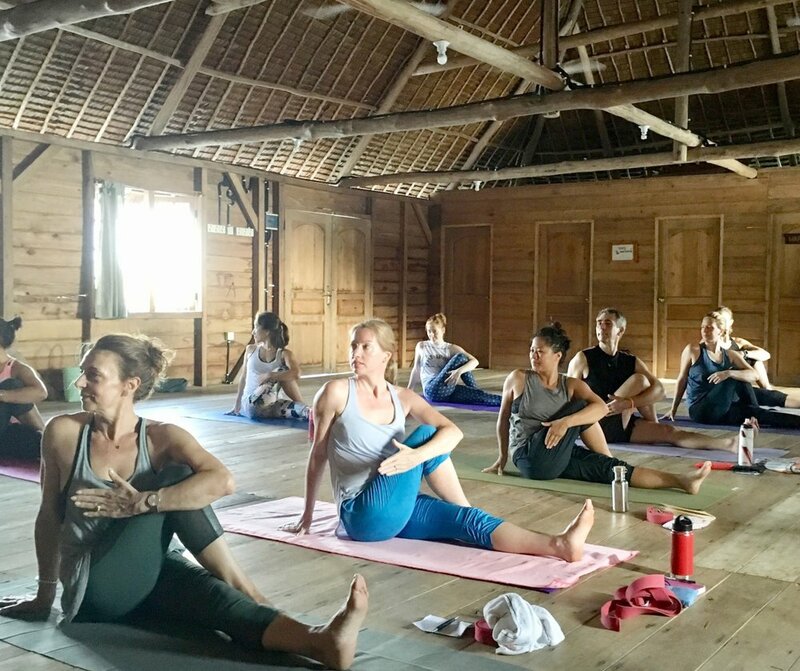 In this retreat our twice daily Yoga classes will be a healthy mix of focus and hard work to warmth, lightness and humour. Every morning you'll be lead through either a slow alignment based flow sequence or a Hatha class. And in the afternoon a slower, more relaxed Hatha or Yin Yoga class. I’ll also lead you through meditations, visualisations and practical mindful techniques. 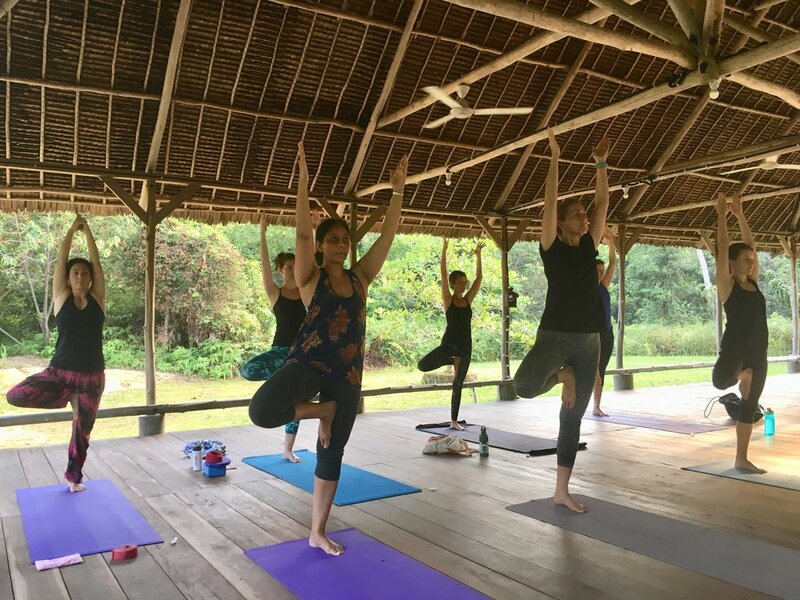 You'll receive 6 two hour Yoga classes from Friday afternoon to Monday morning and will clearly feel your understanding of Yoga, meditation and your pose practice jump up to the next level. We'll also incorporate some fun and self-empowering philosophical teachings on the chakras and inspired learning from a hindu goddess or two in these longer than usual classes. — Carolyn Sivaram. Pre-natal Yoga teacher. Accommodation, all meals, six Yoga workshops, beach games and activities and the boat transfer from Batam to Telunas and back are all included in the price. There's only a weak and very unreliable wifi connection (which to me is a big bonus!) so you'll need to catch up with emails before coming. The ferries from Singapore to Sekupang terminal, Batam and return need to be booked and paid for by you with the ferry company. It's very quick and easy to do online. You will need to book the 11.10 am ferry from Singapore to Sekupang to leave on the 30th May. The return ferry, from Sekupang, Batam back to Singapore on the 2nd June at 12.30 must be booked too! The return ticket from Singapore Harbour Front to Sekupang (Batam) is around SG$50. 6.15 am Yoga *Note this part of Indonesia is 1 hour behind Singapore so it feels like 7. 15 am! Free time for rest, massage and/or beach activities. After dinner: Beach and bonfire with marshmallows, board games, bonfire, star gazing, chat, read, wind down, sleep. 12.30 Ferry from Batam to Singapore. *One hour Balinese and fusion massages can be booked on arrival and are IDR 650,000 for one hour. To pay by credit card please click on the correct image below. If you would like a little extra peace, quiet and privacy I’ve reserved 3 single rooms which come with a SG$110 single room supplement. Please note single rooms are similar is size and layout to the shared chalets but don't have a balcony or a desk. Prices includes your 90 minute boat trip from Batam island to Telunas, all meals, all Yoga classes and your accommodation. Not included is international travel from Singapore to Batam Indonesia (about $SG50 total return ticket) and travel insurance which is a required. Please read my terms re cancelation policies and more before signing up. I can't wait for this amazing retreat to begin! disconnect from everyday life, be fed well, relax and do great Yoga!